Hello, all you beautiful, wonderful people. During the course of the last couple of months, I have been putting myself through a metaphorical boot camp, attempting to improve the quality of my in-game models and animations. It had always lingered over my head that those state-of-the-art, super high quality mega awesome ROBLOX games had been able to drop the jaws of millions of players globally by using tools I, nor any of my teammates, knew how to use with precision. Because of this, we adapted to the harsh landscapes of ROBLOX Studio asset creation, and were doing well enough, but not the impeccable handiwork we so longed for. This video here, shot in late September, showcases the developments of our game, using union weapons and armor, sprinkling in the occasional free-model hood or helmet to smooth out the edges. Many were pleased with the quality of the models, but mention of the programs Blender or Maya continued to surface, making me question if perhaps I could be a part of ROBLOX’s era of custom meshes. 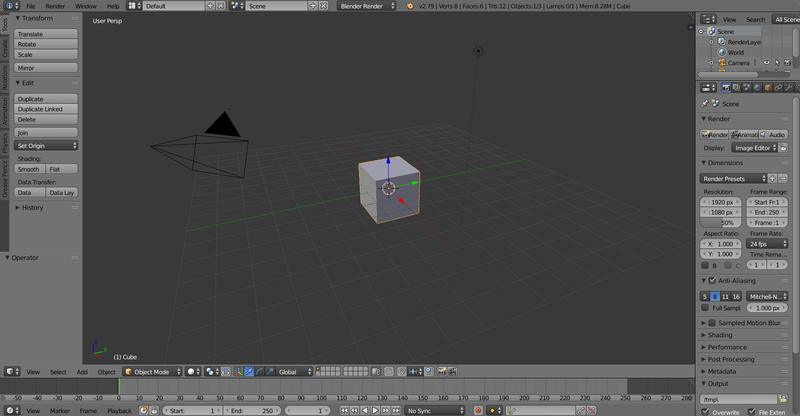 So, I began taking my first strokes into unfamiliar waters, and downloaded Blender. Upon first glance, my stomach sank to my knees. This interface was incredibly differet from my good ol’ friend ROBLOX. and I couldn’t even get the camera to move! But my ego is too inflated to admit defeat, so I went to the internet’s Holy Grail, YouTube. With a couple of clever keywords, I found a wonderful series detailing the interface and usage of the program. Many Blender users may recognize the following video series, may groan in remembrance of their early days, but will agree with its usefulness and delivery. This series, created by a channel known as Blender Guru, opened the floodgates to a new world of asset creation for me. Although a rather long watch, this series shows you everything you need to know, from keybinds to workflows, and everything in between. It also details a rule of thumb to remember for learning any new software that really stuck with me through the rest of my learning process, and this is something he called the 80-20 Rule. Essentially, 80% of your final product is going to come from 20% of the tools the program has to offer (generally). Remember that confusing interface with all the fancy doo-dads and zing-bits? 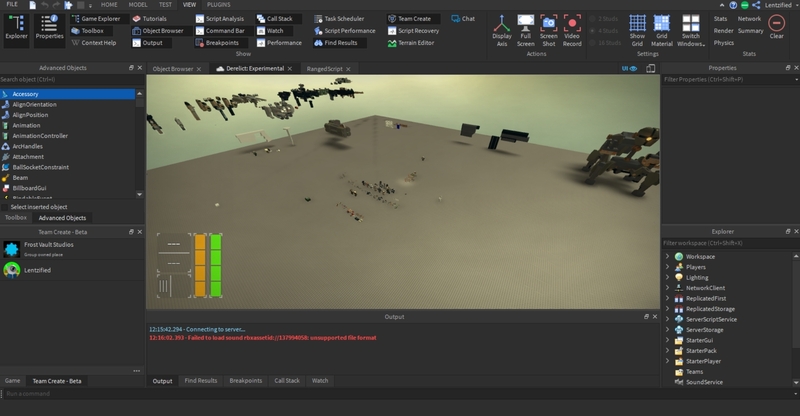 Now look at the interface for ROBLOX Studio. There’s a lot of weird bits and pieces to this interface, too. I bet if you decided to click through all of the parts of it, you’d find a good amount of buttons and features that have little to no use to you. ROBLOX follows this same 80-20 rule, so already we can take some sighs of relief! So, I buckled down, got some snacks, and binged some good ol’ Blender Guru, pausing as I need and following along in my own little Blender window. The first thing I tried to model (other than the mug in the tutorial) was a low-poly bullet for my game! I even ended up using it and variations of it for pickup items in game! I was ecstatic! Not only had it been much quicker than making it in Studio, but I learned a little fun-fact about using meshes in studio: they’re way less lag-intensive than unions! See, unions are made in a program that isn’t specifically made for creating 3D models. While it works very well, it’s not as optimized as it could be. Making meshes yourself will help you keep your game lag-free, while helping it look pretty! We all remeber Deadzone, right? If you don’t it was one of the original apocalypse games back when Apoc Rising 1 was the highest end game around. However, Deadzone became a game you may have heard of more recently, and that’s Unturned. Yes, that funky little Unity zombie game that’s being remade that took the world by storm. Many people were inspired by their low-poly weapon design (as I was myself), and took it upon themselves to help the people of the internet learn how to make similar weapons! Now, I know you’re sick to death of tutorial series’ by now, but this one helped me learn weapons in no time. I want to share a definition word with you that I believe is important in all aspects of game development, and that’s workflow. Understanding how to add and manipulate parts in a program is a great start, but if you don’t know what you’re doing or “where I’m going with this”, then you might be in a bit of trouble. Looking up specific tutorials to your design ideas will give you a workflow that you can build on, that someone who already has all the experience is willing to share bits of with the world. Using this tutorial, I went crazy making weapons! I made about 15 guns in this program, developing my art and workflow as I went. the AK (my first weapon) took me almost two and a half hours to complete. The Tec-9 (a later weapon) took only 30 minutes, as during those few weeks I was creating a workflow that worked for me. I continued this path of finding workflows on YouTube, using keywords like ___ tutorial Blender or how to make ____ in Blender, following along as I watched each of them. My first Blender model is dated October 30th, 2018. Today, December 26th, I’ve learned how to make various props and items, as well as armor. I do believe it’s difficult to get started. Your first model may not be any good. Maybe not even your 5th, maybe not even your 10th. But, as you continue to try and create, you’ll get better and better, and eventually you’ll create something amazing. While messing around on YouTube, I stumbled upon another tutorial for something I heard of through the grape-vine, but hadn’t tried yet. See, in addition to making models in Blender, you can also make animations. Many of you know this already, but what you may not know is it’s possible to get them into ROBLOX, and it’s a lot easier than you might expect. I really hope this helps anyone who’s trying to learn Blender, or really any new program for that matter. Thanks for reading this book of a post! Which program is better to use for building? This experience highlight is amazing. I love your tone and ability to tell a good story. Bookmarking this to share with anyone thinking of using Blender. Extremely well written. I think you’ve convinced me to start using Blender. Please go away, the court documents said I can’t have any communication with you anymore after the “incident”. Just kidding, bud! Thank you much! Can’t wait to see what we can create together with it! How exactly did you get into armor creation, are there any tutorials out there that could help me and anyone else trying to create armor? Hello! Armor creation is something I partially figured out on my own, as well as found a variety of videos to help me various problems. I found a few videos regarding helmet creation, but techniques for armor creation came from experience in the ROBLOX engine. While I can offer you all the tools you need to use the program to the best of your ability, I cannot offer artistic inspiration or experience. That’s something that just comes with trial and error! Oh yeah that makes sense. I’ve been looking all over the internet for tutorials on creating armor for the roblox rig in blender but I couldn’t find any, guess I’ll figure it out somehow.Thanks for your time this post was very helpful! Absolutely! One other thing I found useful is to ALWAYS use reference images while working. Whether that’s a reference you drew by yourself, or an image off the internet, you’ll notice a sharp increase in quality when you’re working with a pre-made image. Thanks for the tip, I actually use this when building haha. Very well written! Thanks for the resources and your journey. Problem is that I cannot find any tutorial for making roblox armour! I think you could make one! Thank you so much for this post. I’d downloaded blender a while ago and got discouraged way too easily. It was so overwhelming but this post showed me that it’s probably not as hard as it looks. I am now definitely going to try again. Again thank you. You know, at some point, I just might. Got a lot going on with work lately, but I’ll get around to it! Wow how did I not come across this sooner, Well done friend! Really amazing, I’m sure this gives both myself and others inspiration to try and pursue modelling/animation through Blender and many other programs! Hi Lentzfied! Hi would like to create an apocalypse showcase with you, if you want of course and if you are free to do it. If you accept could you please contact me on discord: whostoletheguacamolle#9614 I’ll send you some pictures of my work there!